CARLSBAD, CA (April 18, 2018) - Today Callaway Golf has officially introduced its new line of Odyssey EXO Putters. 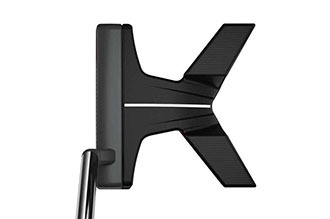 The EXO family of putters aims to increase forgiveness on off-center hits, while an updated face insert helps golfers get the ball rolling more quickly. 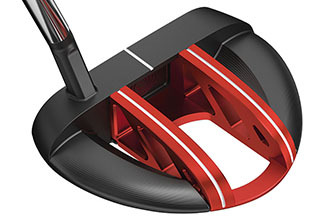 The first thing golfers likely will notice when they see any of the three new Odyssey EXO mallet putters is the sharp contrast between the red middle section, the black perimeter portions of the body and the white face insert. Each of those areas has been designed to provide a specific performance benefit, and working together they provide a more consistent roll and enhanced touch on the greens, Odyssey said. The red pieces in the EXO Seven and Rossie are milled from 6061 aluminum and are designed to save weight while also making it very easy to align the face to the target line. By making the middle of the putters light, a more significant percentage of each head’s overall weight is positioned in the perimeter made of stainless steel, which is heavier than aluminum. With more mass behind the heel and toe, the moment of inertia increases and the EXO putters will twist less on off-center hits. That should help keep mis-hit putts rolling along the intended target line. The EXO Indianapolis utilizes a blend of aluminum and stainless steel, and its X-shaped body pushes more weight back and away from the middle. The first microhinge face inserts appeared last season, but Odyssey has updated them and combined them with the popular White Hot face insert. Engineers designed a 17-4 stainless steel mesh over thermoplastic elastomer to make the microhinge insert. The hinges are stiffer than last season’s and three times wider. The result is a slightly louder, higher-pitched sound at impact, which Odyssey said should appeal to more golfers. The microhinges still compress at impact, then spring upward to encourage the ball to start rolling more quickly and skid less. Each of the three head shapes will be available in a face-balanced version for golfers who make a straight-back, straight-through putting stroke, as well as a version that has a slight amount of toe hang for players who make an arced putting stroke.